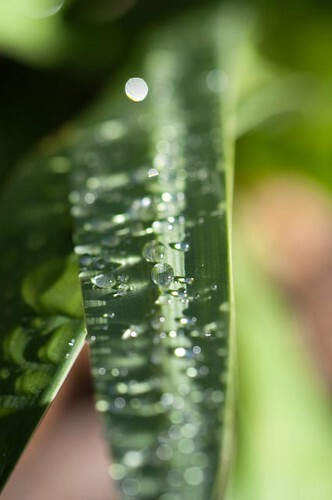 LeafWaterDrops, originally uploaded by justjimwilldo. I got a new lens the other day. Tamron 60mm f2 macro. I'm loving it so far. It can tend to 'seek' a bit on autofocus, but once it finds focus I can tweek it with the focus ring without taking it off of AF. Neat. It has, as you'd expect, a very shallow DoF at f2 and I'll have to sit down and take some calibration shots of my steel rulers so that I know what to expect. As you can see, it also provides nice bokeh both in front of and behind the plane of focus.